If you already have managed chat and call tracking set up for your clients and your agency you already know the advantages of traditional managed chat and phone tracking, but you probably don’t know why you should switch to Juvo Leads. 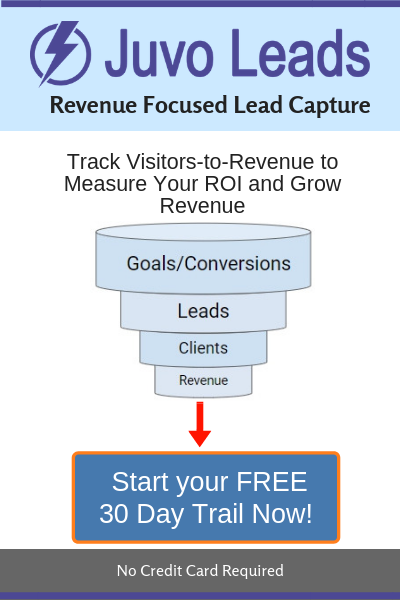 Here are the top 10 reasons you should make the switch and consolidate your lead capture with Juvo Leads. 1. Consolidate: Go from 2 vendors, with 2 systems, and 2 set-ups, and 2 dashboards, and 2 payment structures, to 1 white-labeled solution. 2. Centralize Data: Consolidate your lead data into 1 dashboard. Instead of pulling you call data from one source, your chat data from another, and your form submission data from yet another, have all this information in one place. 3. Agency Overview: See your lead data for each client as well as the total leads your agency earned on one easy to read dashboard. 4. Save Time with Reporting: Putting together monthly reports no longer means consolidating data from multiple sources. Export lead data with the click of a button, send custom reports to your clients on a monthly basis, or better yet, give your clients full access to their own private dashboard and never send another report again! 5. Save Time with Setup: When you bring on a new client set up for call tracking and managed chat in minutes instead of hours. 6. Provide Custom Client Dashboards: Provide a private lead dashboard for all your clients. Give them a login and password so they can go to your website, login to your white labeled dashboard, and see their lead data whenever they want. 7. Better Chat: Our chat applets convert at a higher rate than our top competitors, our dashboard is better, and our chat agents are trained to provide custom answers based on each website’s frequently asked questions. Check out our standard mobile chat applet below on the right compared to the competitions on the left. 8. Increased Retention Rates: Keeping clients well fed with new leads is the key to any great agency-client relationship. What better way to gently remind your clients of the work your agency does then to send them notifications from an email address of your choosing whenever a new chat lead is submitted. 9. Price: Juvo Leads saves you money. Replacing your current managed chat and call tracking solution will save you on average 20-60% on your lead capture cost each month. Because of our flat pricing structure, some agencies have chosen to upsell our chats on a pay-per-lead basis thereby creating a new revenue stream for their agency. This probably isn’t for marketing agency but just serves to show the SIGNIFICANT cost savings that Juvo Lead provides. Check out our Agency Pricing HERE. 10. Free Trial: Try us out for a free trial and see all the advantages for yourself. What do you have to lose?